Chuck Meets a Manly Gladiator That Is Absolutely Not a His Daughter in Disguise | Words. On the Internet. Believe it or not, I used to be a gladiator when I was a child. Well, not really. At all. Chuck stared at the man in the center of the arena, a long, blood-soaked sword clutched in his undeniably masculine grip. Everything about him screamed manly: from the tufts of black, curly hair poking out of his chest plate, to the way his deep voice reverberated around the stone coliseum, to the mustache clearly situated just beneath his abnormally pink nose and large black glasses. There was absolutely no doubt in Chuck’s mind that he was staring at a man. “You’re out of your mind,” Chuck said, leaning over the railing and staring down into the blood-soaked arena. Bodies lay strewn across the amber sand, limbs detached and scattered about. He took a deep breath, held it, and then exhaled, his heart racing. He loved watching the men fight for his daughter’s hand in marriage, throwing their lives on the line for a chance to become her husband. Unfortunately, though, the process had been taking quite a bit longer than he’d anticipated. Despite his requests, his scoldings, and his threats, his daughter continued to disguise herself as a man and enter into the competitions, winning each and every time. This was now the seventh tournament in what was quickly becoming a monthly occurrence, but Chuck new they’d finally found a victor. In fact, he was probably even named Victor. Chuck watched as the gladiator subtly walked backward and bent down to pick up each ball of fuzz, shoving it into his chest plate and glancing around as if checking to see if anybody was watching. Of course people were watching, though—they were in the middle of a two-thousand-person coliseum, the crowd cheering almost violently for their winner. Whatever the case, however, Chuck knew he was definitely looking at a man. He probably just suffered from a sudden case of Alopecia and needed to make sure he re-gathered all of his chest hair. Heck, that had happened to Chuck on at least one occasion as he recalled. “Wrong,” Chuck said, turning around and facing the crowd. He lifted his hands in the air and waved, the audience responding with a tremendous roar. “When was the last time you saw a woman wearing pants,” he said, turning back toward Lucy. “Whatever,” Lucy said, again sitting back into her chair and picking up the book that sat on the table beside her throne. The gladiator stared up at Chuck and opened his mouth, his mustache—including his nose and glasses—abruptly sliding off of his face and down into the orange dirt below. He stared at Chuck for a split second before collapsing to his knees and blindly grabbing at his fallen mustache, finally shoving it onto his face. Chuck looked away for a moment in an attempt to give the man some privacy while he mended his troubles. He knew that if his own nose, mustache, and glasses all fell off at once, he’d like a few seconds to gather himself. Thankfully, though, he had no mustache and thus did not suffer the terrible ailment. “Please,” Chuck shouted, turning toward Lucy. She was so inconsiderate. “The man is suffering from a terrible disease, do not mock him.” He turned back to the gladiator. “Your name?” he reiterated. “That’s exactly what I mean, and I’m sure she can,” Steve said, shifting slightly, his sword hanging from his right hand, a few puffs of black hair still clutched in his left. “Really?” Steve said, readjusting his nose. “Great. Then, I must be off. 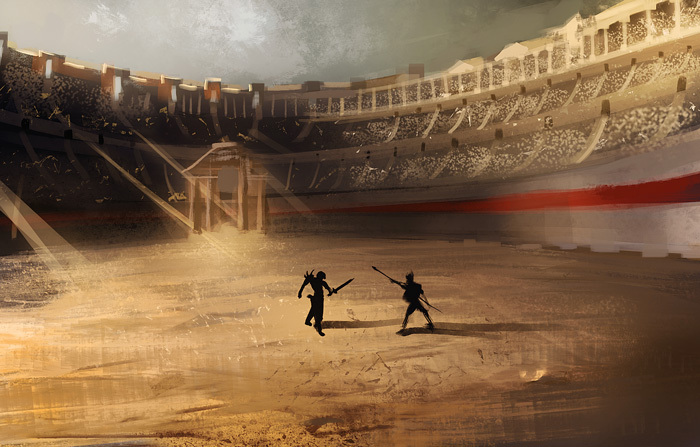 I need to go pee standing up.” He turned and began walking toward the gated entryway to the arena, the steel bars slowly lifting as several small, skinny men pulled on the rope beside them. Chuck turned back toward Lucy and smiled at her. Her eyes were wide, head tilted almost as if in disbelief. She was clearly amazed at how well he got along with men who had proven themselves in combat.